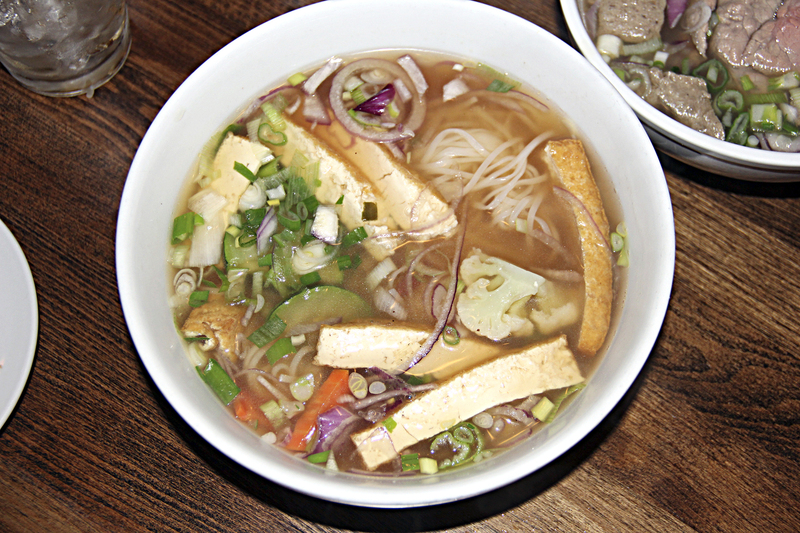 Back in 2012, Vietnamese chef Joe Bui hit the road with his native region’s cuisine in tow. 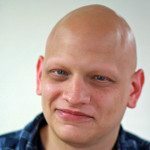 He parked his food truck, The Rolling Spring Roll, on Melville’s Spagnoli Road, an industrial stretch connecting Route 110 to all points west. His fresh, scratch-made recipes caught on and soon Bui opened Long Island’s first full-service Vietnamese restaurant on Main Street in Farmingdale. This year, Bui rolled his Vietnamese dream into a second location on Jericho Turnpike in Syosset. The Rolling Spring Roll’s latest incarnation expands the restaurant’s menu, offering options beyond the original location’s selection of appetizers, noodle soups and Vietnamese sandwiches. 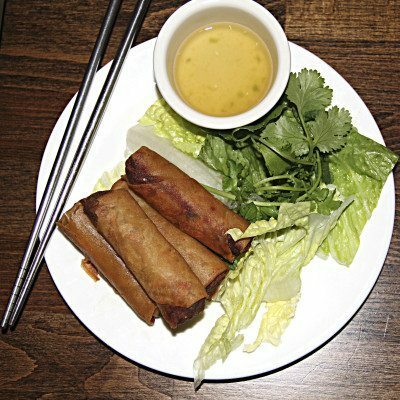 One of The Rolling Spring Roll’s most popular items is its namesake, the spring roll. Crunchy, finger-sized, pork-filled and enhanced with vermicelli noodles, carrots and Vietnamese spices, the spring rolls pack big flavors in a small package. 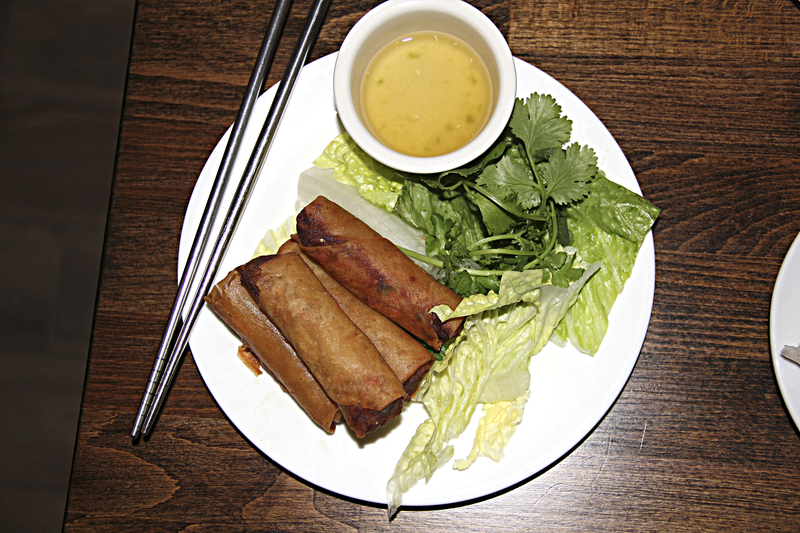 The spring rolls are served with a side of mam nem, a house-made, pungent sauce made from fermented fish. Playing counterpoint to the crunch of the spring rolls, is the fresh garden snap of the vegetable summer rolls. Served with a richly flavored peanut sauce, the summer rolls boast rice noodles, tofu and bean sprouts rolled in rice paper. Also on the An Choi or “fun food” menu is chef Bui’s tremendous take on chicken wings. Far exceeding wings from national chains and sports bars in flavor, Rolling Spring Roll’s Tan Binh chicken wings are golden, crisp and perfect for sharing. The chef shows restraint in applying the sweet chili sauce glaze, gently anointing the wings rather than drowning them—this technique allows the wing to retain its heavenly crunch. 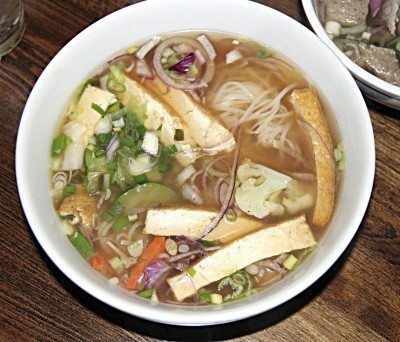 Beyond the excellent dumplings and Vietnamese sandwiches—or Banh Mi—The Rolling Spring Roll’s true charm lies in its selection of Pho, a bowl of beautifully married meats or vegetables with onions and flat rice noodles in a rich and aromatic broth. 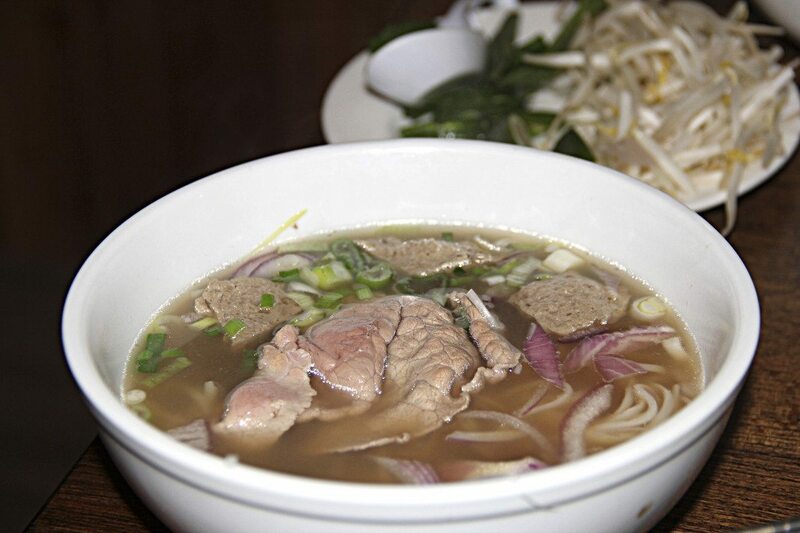 The Pho Bo, with beef, is a big bowl of thinly sliced beef, beef brisket and meatballs, swimming in a fragrant broth dotted with golden flecks of delicious fat. Rolling also offers vegetarian, chicken and seafood versions of this crown jewel of Vietnamese comfort food. The Syosset location’s expanded menu also offers a selection of noodle and rice dishes, including lemongrass chicken, grilled Angus beef satay, sautéed tofu and short ribs, as well as the Spring Roll Bowl—the restaurant’s signature spring rolls cut into pieces and served over rice. And the chef’s house specialty menu highlights unique Vietnamese flavors with dishes like Bo Luc Lac, or shaking beef; Banh Xeo, a pork and shrimp crepe and Chao Tom & Nem Nuong, which is seasoned shrimp paste wrapped around sugar cane, gently fried and served with grilled pork sausage. Vietnamese cuisine features lively and intriguing fare—and The Rolling Spring Roll is the perfect entry point for any eater into this extraordinary world. The Rolling Spring Roll is located at 228 West Jericho Tpke., 516-677-9090, and at 189 Main St., Farmingdale, 516-586-6097. Visit www.therollingspringroll.com for details.